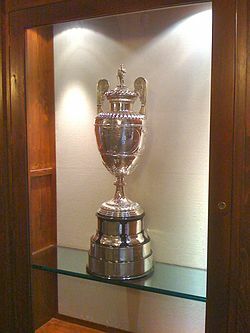 The Amateur Championship (sometimes referred to as the British Amateur or British Amateur Championship outside the UK) is a golf tournament which has been held annually in the United Kingdom since 1885 except during the two World Wars, and in 1949 when Ireland hosted the championship. It is one of the two leading individual tournaments for amateur golfers, alongside the U.S. Amateur. It normally has the widest international representation of any individual amateur event, with 38 golf federations from all six continents represented in the 2018 championship. Before World War II it was regarded as one of golf's major championships, but given the modern dominance of the sport by professional golfers, this is no longer the case. Two Amateur Championship winners in the post-World War II era have gone on to win professional major championships: José María Olazábal and Sergio García. The inaugural championship was held in 1885 by the Royal Liverpool Golf Club and was, for many years, regarded as an unofficial event. In 1922, the R&A decided that Allan Macfie, the winner of the event, should be added to the list of Amateur Championship winners. The tournament was played on 20, 21 and 23 April and was "open to all amateur members of recognised golf clubs". The format was match-play. All players were included in the draw for each round, any extra player receiving a bye. If a match was halved after the 18 holes both players progressed to the next round, playing each other again. There were 49 entries from 12 different clubs, although only 44 were included in the draw and four of these players did not turn up. Of the 22 first-round matches, 2 were halved, meaning that there were 12 matches in the second round. There were no more halved matches in the following rounds which meant that 3 players reached the semi-final stage. John Ball beat his father, also called John, in the third round. Allan Macfie received a bye at the semi-final stage with Horace Hutchinson beating Ball 2 up in the only semi-final match. After his morning round, Hutchinson played badly in the afternoon and Macfie won 7&6. Each player paid a 1 guinea entry fee. This, together with 25 guineas from the Royal Liverpool club, was used for prizes. The losing finalist received £10 with the remainder being used to buy plate for the winner. The final amount for the winner was about £60 or £70. By comparison the winner of the 1885 Open Championship received £10. Entry to the Championship is now given to the most-qualified 288 applicants from around the world, with perhaps half the places reserved for top players from the United Kingdom and Ireland. Qualifying rounds for all players were first introduced in 1983, when the popularity of the championship led to the number of applicants increasing to unmanageable levels. Major golf nations are allocated entries on what amounts to a quota basis for their top applicants, with each applicant's national federation cooperating with the R&A on selection. For example, the 2010 entry list included players from the British Isles (England, Wales, Scotland, Ireland, Northern Ireland), mainland Europe (France, Belgium, Netherlands, Germany, Italy, Spain, Portugal, Sweden, Norway, Finland, Denmark, Slovenia, Switzerland, Austria, Iceland), North America (USA, Canada, Mexico), South America (Argentina, Bolivia, Peru), Asia (China, India, South Korea, Japan, Singapore), Australasia (Australia, New Zealand) and Africa (South Africa). The first stage of the Championship involves 288 players, each of whom plays two rounds of 18 holes, one on each of two courses, over the first two days. The 64 lowest scores over the 36 holes, and ties for 64th place compete in the match play stage of the Championship, on the event's principal course, and are seeded by qualifying scores. Each match consists of one round of 18 holes, except for the Final, which is over 36 holes. Since there are generally more than 64 qualifiers from the stroke play stage, the first round of the match play involves a small number of matches to reduce the number of qualifiers to exactly 64. Tied matches are broken by sudden death over extra holes. The event is played in June, normally with a Monday to Saturday schedule. The winner receives invitations to three of the major championships, namely the following month's Open Championship, and the following year's Masters Tournament and U.S. Open provided he remain an amateur prior to each major. The Amateur Championship is open to amateur golfers of any nationality in good standing with their national federations. Briton John Ball won the most career titles, with eight. Ball was still competing in the event as late as 1921 at Royal Liverpool Golf Club. In modern times, Briton Michael Bonallack's five titles lead. The most famous American winner of the competition was Bobby Jones, whose 1930 victory was part of his Grand Slam. 1946 Royal Birkdale Golf Club Jimmy Bruen Ireland 4 & 3 Robert Sweeny Jr.
2019 - Portmarnock Golf Club & The Island Golf Club. 2020 - Royal Birkdale Golf Club & West Lancashire Golf Club. ^ "International field assembles for The Amateur". The R&A. 14 June 2018. ^ "Golf – Meeting of the Championship Committee". The Times. 3 March 1922. p. 8. ^ "Golf tournament at Hoylake". The Glasgow Herald. 21 April 1885. p. 7. ^ "The golf tournament at Hoylake". The Glasgow Herald. 22 April 1885. p. 9. ^ a b "The golf tournament at Hoylake – Victory of a Scottish player". The Glasgow Herald. 22 April 1885. p. 8. ^ Rice, Grantland (25 May 1921). "Wright Only U.S. Golfer Left in Play". The New York Tribune. Retrieved 12 April 2015. ^ Reid, Philip (8 September 2016). "Portmarnock to host Amateur Championship despite men-only policy". Irish Times. ^ "Venues announced for 2020 championships". The R&A. 25 July 2018.